Ichthyosaurs: a day in the life… | A blog following, and detailing, my life and work with ichthyosaurs. A blog following, and detailing, my life and work with ichthyosaurs. This documentary follows the story of a newly discovered ichthyosaur found near Lyme Regis in Dorset, UK. The collector, Chris Moore, is one of those lucky people who can spend much time on the beach, so has found many important fossils over many years. This includes the ichthyosaurs Leptonectes moorei, which is named after him. I also don’t think I’ve ever seen him not smiling. I’ll post a bit about how I became involved in the programme, and some of the story alongside it, after A&tSD airs. I’ve only seen an earlier cut of the programme itself – at that point the producers, editors, animators, and many more had done a great job – and am looking forward to experiencing the final version. Hopefully you’ll enjoy it too. The great thing is that ichthyosaurs are so awesome: no one feels bad about spending all their time thinking about them. That’s what I’ve spent my last four years doing. It will also be what I spend a large part of the next three years doing. Certainly that doesn’t mean that ichthyosaurs are the only interesting thing out there: having the joy of being in such a large research group, there are so many people doing so many different things in palaeontology. I’m looking forward to the next three years and also the trials and treats they will bring. All of that is a prelude to the announcement that that PhD that I started in 2011 is now at its end, in the first instance: there remain only the corrections and eventual publishing (hopefully) to deal with. And in the meantime, I’ve only gone and wrangled myself a job! much to my parents amusement, surprise, and pleasure. The joy of not having a PhD is that there is no burdening deadline rapidly approaching where everything becomes do-or-die; no letters threatening to kick me off the course should I not submit by such and such a date (ahem); no late nights worrying about all those things that you could do, haven’t done, should have done, want to do … people say that doing a PhD is one of the most stressful things you can do in life. Thankfully, I’ve spoken to various postdocs who say that finding grant money afterwards is much worse, so I have that to look forward to. But the great thing about doing a postdoc – and, particularly from my point of view, doing the postdoc that I’m doing – is that what I am doing next is a continuation and extension: as part of the continuing JESBI (Jurassic Environment of Strawberry Bank, Ilminster; I don’t know whether it still has that name) project I’ll be doing more ichthyosaurs anatomy, adding in some marine crocodilians, then extending to do function studies with a slew of numerical, engineering-based techniques; all in the spirit of onwards and upwards. This is alongside the venerable esteemed coalition of Matt Williams (Bath Royal Literary and Scientific Institute); Mike Benton, Emily Rayfield, and Jakob Vinther (Bristol); Matt Friedman and PhD student (Oxford), and Andrew Ross (National Museum of Scotland). Rather conveniently, this has been summed up recently be several of the above in an article, webpage, and was also presented at the Palaeontological Association Annual Meeting earlier this week. This is simply an introduction and notice of changes – this post doesn’t actually say that much. It’s spring cleaning time, so I’ve decided to shake up the blog (ha! yes this really is meant to be a blog) and give it a bit of a refresh by changing the design. There are also things that I’m steadily updating. As always, there are potential future posts and ideas that may come to fruition, and of course, a PhD to finish in the meantime. It’s been yet another long while. I put this down to having a thesis to write (and what a thesis! ), and conferences, and travelling, and all those other things that I’ve been complaining about for a long time and will continue to do so … blah blah blah yacketty yacketty. But this isn’t a piece to complain about that. This is about seeing the other side of the conference hand, and fully appreciating the stupendous hard work that others have put in to make these great. 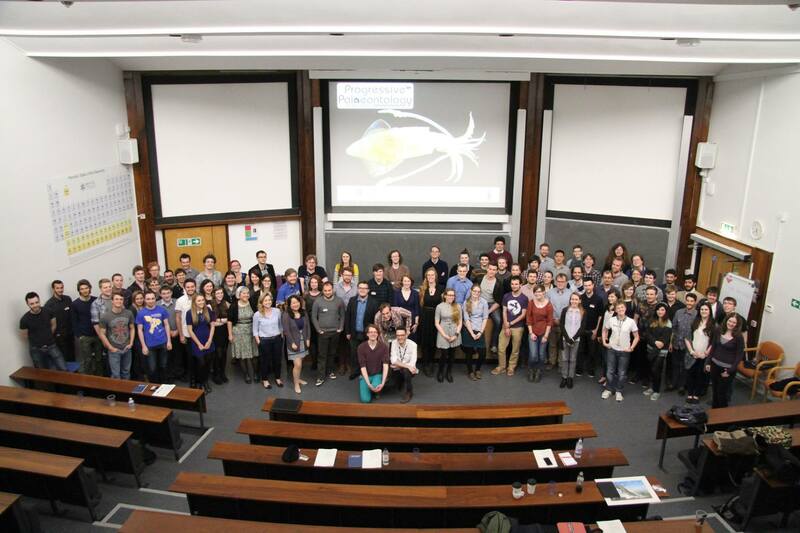 Earlier this month, the University of Bristol Palaeobiology Research Group (to give us our full title) hosted Progressive Palaeontology 2015. This is a student-led conference that attempts to offer a relaxed space for current students to present what they’re working on, from any area of palaeontology. After making the, what I subsequently found to be, foolish offer to build the information and abstract booklet, I was roped into the committee alongside Joe Keating (the leader), JJ Hill, Chris Rogers (second-in-command), Mark Puttick, Luke Parry, Max Stockdale, Al Tanner, and Fiona Walker. We had over 90 people register for the conference, from many institutions, and four countries. The 26 talks and 24 posters covered various topics from Triassic tetrapods to alteration of melanin and fossil colour, muscles in Psittacosaurus to Mesozoic mammal ecology. All talks were excellently given, and showed a huge variety of topics and methodology; great promise in these progressives. The conference photograph taken by David Marshall. After the conference, we had an excellent dinner, and held an auction to benefit future travel grants for ProgPal. This was overseen by the inimitable David Button, Esq., who admirably raised the roof, and the price, of artwork, mugs, and slabs of rock; we made over £700 in total, a monument to the generosity of those who were there. The next day, on the field trip, we visited three excellent localities near Bristol and along the Welsh Marches. With the inimitable David Button, Esq., looking resplendent in his guise as union chief, we took in the Triassic–Jurassic boundary at Aust, finding small fragments that had fallen down the cliffs from the Rhaetian Bone Bed. Next, we went onto the Silurian inlier at Usk to capture various brachiopods, bivalves, and even some trilobite fragments. However, the best find of the day was found after the excellent pie-pub lunch at The Crown Inn. At a Devonian locality in Crasswall, which produced many jawless fish fragments, the very lucky Dave Marshall found a shoulder plate from a large eurypterid; this made Dave a very happy bunny. So that wraps up a little on what happened over the conference. Besides having the fun of being at the conference, as I have before, it was also enlightening to see how much work goes into the preparation of such. While editing, and chasing after, so many abstracts is not the easiest of jobs, I don’t envy those who had to deal with rooms and catering and stuff. Progressive Palaeontology is organised with the help of the Palaeontological Association, and funding for this year also came from the Geological Society of London. Prizes were donated by Cambridge University Press and Siri Scientific Press, and Bob Nicholls, Luis Rey, and Mark Witton. Additionally, the Paleontological Society and Society of Vertebrate Paleontology donated money towards travel grants. You can find more information about this year, past years, and the next years (when it comes up) at the ProgPal website. In the last post, I detailed a bit about my general writing workflow. I thought it would be useful to summarise the software that I’ve mentioned and give a brief description here, with links. Scrivener for Mac: basic and simple are the wrong words, but this allows you to focus on writing. Bookends for Mac: highly customisable and compatible referencing. Papers for Mac: organises my papers life. Mellel: writer with many writing features. Nisus Writer Pro: writer with many writing features. Versions for Windows are available for Scrivener and Papers. And my general workflow: Scrivener + Bookends → Mellel + Bookends → Nisus Writer Pro. Also, because I thought it would be fun (I am rather odd), I made this post and the last into a pdf, which you can find here: Where have I been.pdf.